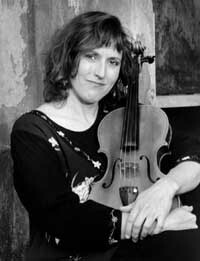 Katrina Wreede, composer and violist, has been a professional symphony musician, a jazz violist, a member of the ground-breaking Turtle Island String Quartet, a concert soloist, a belly dancer, a police finger-printer, a strolling, rhinestone-studded �continental� violinist for royalty, a non-denominational wedding officiant, a player of Tango Nuevo, Persian, Roma (gypsy) and Central European music and a composer for soloists, chamber ensembles, orchestras, film, and dance, sometimes collaborating with other artists to create works about social injustice. Her works are distributed by MMB Music and performed internationally, including �Mr. Twitty�s Chair�, performed regularly by the Ahn Trio and in its 10th touring season with the David Parsons Dance Group. Her most recent recorded works appear on the Vox Novus� �60 x 60� and the Pegasus Quartet�s �Healing Heart�. She is a founding faculty member of the John Adams Young Composer Program and has taught advanced composition to exceptional youth musicians from 1998-2004 and 2007-8 for the American Composers Forum. She created the Junior Composer program for the Berkeley Symphony and conducts workshops on improvisation and composition around the country, including at Boston Conservatory, Cal Tech�s Prep High School, and Berklee College. Recently she has written works for the AXIS Dance Troupe, the San Jose Chamber and Youth Orchestras, the Tassajara Symphony, the Pegasus Quartet, the Menlo Brass Quintet, ACF�s �Music for People to Play�, and works for her groups, Synchronopolis and the Serafine Trio. She is a contributing author to the American String Teachers Association book, �Playing and Teaching the Viola� and contributes articles to Strings, the ASTA Journal, Journal of the American Viola Society and other music-oriented magazines and newsletters. She also wrote a handbook for the American Composers Forum on teaching composition to teenagers. For 2007-8 she has created a comprehensive 5-year composition curriculum for the Bronxville, New York School District for grades 8-12, and plans to publish the resulting product nationally to introduce more young people to the joys of creating, not just consuming, music.